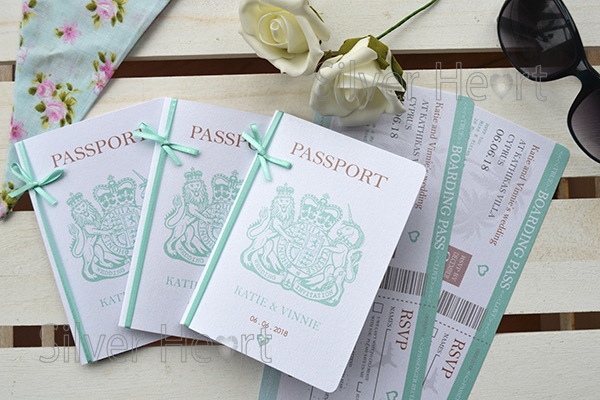 Passport wedding invitations for weddings abroad, travel themed invitations, destination wedding invitations, Passport style card with insert containing invitation, resort information. Boarding pass style RSVP, Day invitations, Evening Invitations, Order of Service, Menu, Place Cards, Save the Date, RSVP, Table Plans, Thank You cards, Silver Heart Stationery, weddings, yorkshire, huddersfield, leeds, west yorkshire, huddersfield. Hover your cursor over, or click on the smaller images below to see a larger image. Our Fixed Bow Passport wedding invitations and Boarding Card RSVPs are perfect! The optional RSVP is in the style of a boarding card and has a detachable reply slip and optional mini Kraft envelope. Colours are of course flexible. Our passport Cards can be printed in many different shades and the ribbon comes in a large variety of colours which you can either match to your print colour or you can have it contrasting if you'd prefer. Simply contact us to order a set. 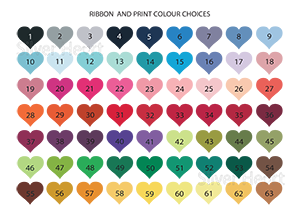 63 COLOURS ARE AVAILABLE when buying sets of Passport Invitations. Sample colours are random. READY TO ORDER SETS OF STATIONERY? WHAT OTHER STATIONERY IS AVAILABLE IN THIS RANGE? We also do Save the Date, Evening Invitations, Order of Service/Day, Menus, Place Names, Table Names and Table Plans as part of this range, simply contact us for details. Checkbook and Pocketfold invitations come with two inserts as standard (Invitation and RSVP). However, you can order up to three extra inserts to include: Menu, Gift list/requests and Information (e.g accomodation and directions etc.). To see more about the following invitations, please click here: LONG POCKETFOLD INVITATIONS, SQUARE POCKETFOLD INVITATIONS, CHEQUE BOOK INVITATIONS.